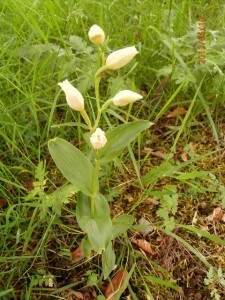 White Helleborine – a new campus record! Question: How many vascular plant species were recorded on campus during the 24 hours of the University of Reading BioBlitz 2013? Well the records have now all been submitted and checked and here at Whiteknights Biodiversity Dr M is proud to announce the official Answer! Much help in this was given by Fay Newbery (PhD candidate in the Agriculture School and who also ran the lichen walk at the BioBlitz) who added many plants to Dr M’s list including a botanical highlight of the day – a dozen plants of the beautiful orchid Cephalanthera damasonium (White Helleborine) growing under a Lime tree near the University library! This plant is on the Berkshire Rare Plant Register (2005) and described as ‘decreasing’ so it is a delightful addition to our list and to campus biodiversity. On the Saturday of the BioBlitz we asked people to guess the likely total, and the guesses ranged from 120 to 3000! Dr M can now officially announce that the grand total is two hundred and ninety-five (295), an impressive number bearing in mind we only had 24 hours to do this and will have missed some species for sure (and we purposely included only native and naturalised species and did not include the many planted and exotic species on campus). As Dr M says, this is yet another example of eXtreme botany and right on our doorstep! And so the winner is: Ryanne Matthias of the Catalogue of Life Project in the School of Biological Sciences at University of Reading who estimated 300! This very close guess wins her a bottle of champagne (when Dr M gets off his computer and gets to the shops)! Close second was Becky Thomas who guessed 330, with another few hours no doubt we could have got there too! If you have any comments or observations please send to j.mitchley@reading.ac.uk. This entry was posted in Meetings/Events, News, Orchidaceae, Plants, Surveys. Bookmark the permalink. Do the lists that students made in the 80’s still exist? Not that i know of Quentin. Stephen Jury would be the one most likely to have them, and he hasn’t.